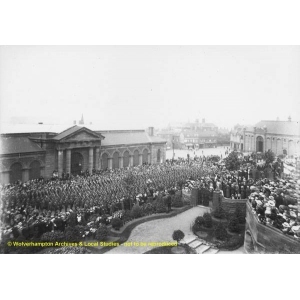 Description: Photograph taken by local photographer Bennett Clark, of soldiers of the 6th. 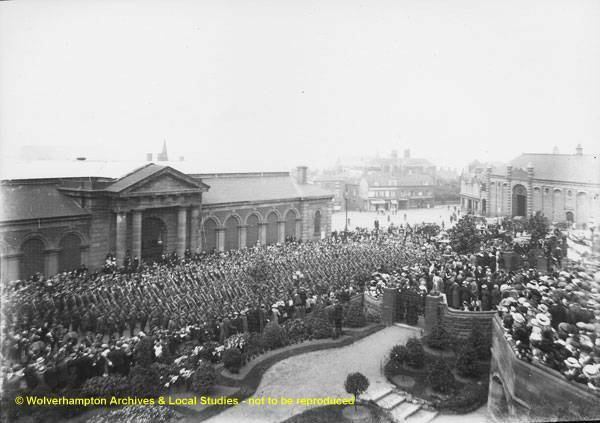 Battalion, South Staffordshire Regiment, being given a Civic Farewell in St. Peter's Square at the beginning of the First World War (1914-1918). To the right stands the Wholesale market. To the left stands the old Retail Market. Apart from the terrace in front of St. Peter's Collegiate Church and Giffard House and chapel which can just be seen behind buildings in North Street (centre right), all of this part of Wolverhampton has disappeared.